Michael Laverty raced to his best finish of the MotoGP season by coming in 13th in the Australian Grand Prix at Phillip Island on Sunday. The Paul Bird Motorsport rider from Toomebridge earned three points in what was only his second points finish of the 2014 series. Laverty is 25th in the standings with five points, two behind team-mate Broc Parkes, who failed to finish. Valentino Rossi marked his 250th premier class Grand Prix by winning. The 35-year-old Italian, who is second in the championship standings, won the 27-lap race from eighth on the grid while Jorge Lorenzo was second. World champion Marc Marquez looked to be coasting to victory when he went off on a corner with 10 laps remaining. 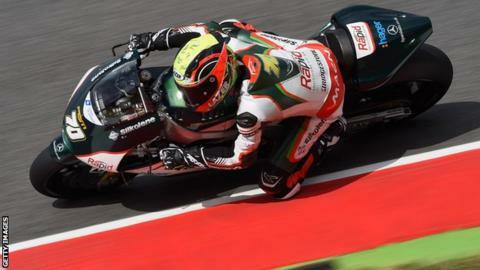 Bradley Smith was third, his first podium finish, after fellow Briton Cal Crutchlow crashed out on the final lap when sitting second.